Find out about the latest developments in smartphone screen and storage tech, as well as new innovations for self-driving cars, a secret Apple project that might affect its future devices, and a plan to make Alexa less chatty – all courtesy of our friends at TechRadar. When software programs are driving cars around our streets, there won't be a human driver to give out signals like nods and waves that we've all got accustomed to – and that help pedestrians and cyclists navigate their way around cars. 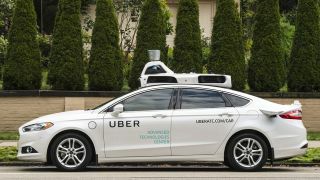 Uber has a fix ready for the self-driving car revolution, namely a system of signs and displays embedded on the vehicle that tell passers-by when it's safe to pass, when the car will be moving off, and so on. We don't like to let a day go by without revealing more on the Huawei P20 range of smartphones that are due to appear on 27 March. The leaks on these phones have been coming thick and fast, and today's bit of speculation covers the on-board storage: apparently both the P20 and the P20 Pro are going to come with 128GB of storage as standard, so that means oodles of room for your movies, music and other digital files. You don't always want Alexa on your Amazon Echo to be rambling on, and some users are reporting that Amazon is testing out a "brief mode" for its devices where spoken responses are replaced by beeps once certain tasks have been completed. So you might get Alexa to turn on your smart lights and have it beep in confirmation rather than give you a long verbal answer. As yet it's not clear whether this feature will roll out to everyone else. Another one from the smartphone rumour mill, this time concerning the LG G7. According to reports, LG has decided to stick to the LCD display tech it usually prefers, rather than opting for the brighter, more vibrant OLED option that Apple and Samsung now favour. How will it affect the device? Well, it might just mean you have to pay less for it, because LCD screens are cheaper to produce. A launch is expected before the end of May 2018. Speaking of screens, there's news that Apple is secretly working on some next-gen display tech of its own – namely MicroLED screens that will allow everything from smartphones to wearables to end up being thinner. The new tech should make for displays that are brighter and thinner than the existing OLED tech as well, though insiders say it's still going to be a few years before we see any of these magical MicroLEDs in devices going on sale.